Democratic Sen. Kirsten Gillibrand acknowledged Thursday that former President Bill Clinton should have stepped down after his affair with Monica Lewinsky. The significance of her statement? 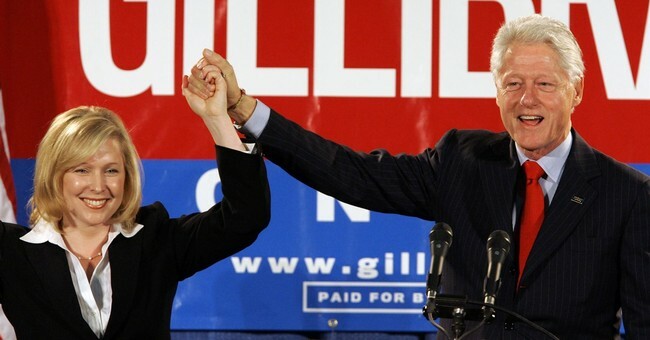 Gillibrand is a longtime political ally of the Clintons and holds the seat vacated by Hillary Clinton. “[I]t was a remarkable statement from a senator who enthusiastically backed Mrs. Clinton’s presidential bid last year but has been deeply involved in legislative efforts to curb sexual abuse and harassment in the military and on college campuses. She went on to say, however, that the political and social milieu in the 1990s was different than it is today, when that kind of conduct was more overlooked. “Things have changed today, and I think under those circumstances there should be a very different reaction,” she told the Times. Gillibrand also expressed her disappointment in the allegations against her colleague, Sen. Al Franken, who on Thursday was accused of kissing and groping Leeann Tweeden, a California sports radio broadcaster, during a 2006 USO tour of Afghanistan. The New York Democrat has said she will donate all the funds her campaign received from Franken’s political action committee to an organization that helps those who were assaulted in the military.